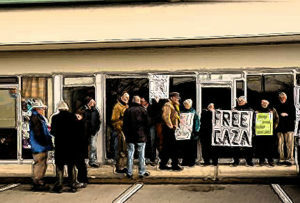 Mid-Islanders for Justice and Peace in the Middle East is a group of committed activists who oppose the harsh and ongoing repression of the Palestinian people by the Israeli state. We do not accept that this conflict is in any way symmetrical or a balance between equal powers. It persists because of the continuing dispossession and occupation of one nation by the other, a military occupation that is illegal under international law. We concur with many leaders and observers throughout the world that Israel is effectively an apartheid state. See the full Statement of Principles. Mid-Islanders for Justice and Peace in the Middle East (MIJPME) was born shortly after May 2010, when several concerned individuals from Vancouver Island met outside the local Member of Parliament James Lunney’s constituency office in Nanaimo, BC, Canada. We came to protest the attack on the Mavi Marmara, a ship sailing with the Gaza Freedom Flotilla. In an illegal act of piracy in international waters, the Israeli armed forces fired on, killed and seized the unarmed humanitarian aid workers carrying relief supplies to the beseiged people of Gaza. Our protest demanded that the Canadian government act to help Canadians on that boat. Why is the government of Canada supporting collective punishment in Gaza? Why does it support Israeli impunity from international law and the Geneva Convention? When Palestinian voters chose Hamas as it’s government in an election acclaimed by international observers for it’s fairness, why was Canada the first country in the world to support the Israeli blockade of Gaza? Why has the Canadian government taken an “Israel right or wrong” position, allowing Israel to continue its implementation of a brutal occupation? We never heard any answers, but this original protest led quickly to the forming of our group from the mid-island region of Vancouver Island in Canada. Ranging from Duncan to Courtenay/Comox, MIJPME has sponsored and brought speakers, information and even music about the occupation of Palestine to our different communities. Since that time the Canadian government has taken a more entrenched position, favouring Israel and refusing to acknowledge Palestinian rights – human rights, civil rights or national rights.